Soft pretzels are my favorite. It was always such a treat going to the mall as a kid and getting an Auntie Anne’s pretzel. Well, now we live right across the street from the mall and we visit often and I have to say, the weight I’ve gained since moving here is 99% from Auntie Anne’s. It has been my weakness. This weekend I just wanted to make a batch of homemade pretzels-I get that urge every once in a while. I tried a new recipe instead of getting out my bread machine. It was an easy, 30 minute recipe. I didn’t boil them this time. I kind of regret it because that’s what makes them taste so chewy, but it always makes a big mess and takes longer. So, I omitted the step, but they were still pretty good! I used all wheat flour, so they’ve gotten pretty dry after several days… but it doesn’t stop me from eating them! They’ve been a hit around here. 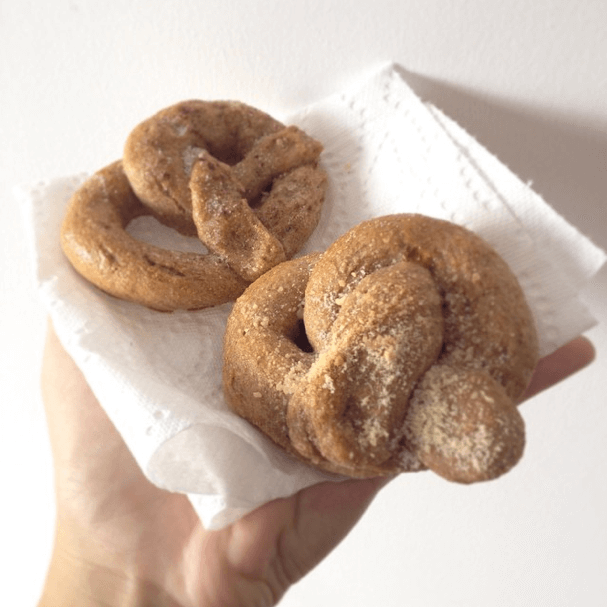 Never made homemade pretzels? For sure try this recipe from Sally’s Baking Addiction! Boil them before baking, if you have time! I made a little glaze to put on top of the cinnamon sugar pretzels… and don’t forget about this yummy cheese dip I posted once upon a time. Surprise, surprise. I tried another recipe from my favorite food blog, Damn Delicious. It was a perfect lunch but would make for a nice side dish at dinner. I didn’t have corn or avocado on hand, so I used edamame instead. Still tasted great! I’ve been baking and cooking a lot recently. My goal for the summer was to try five new recipes because I was in a cooking rut earlier in the year and just kept making the same meals over and over again. But August was different! In addition to those nine recipes I made for freezer meals, I’ve tried more recipes and want to share seven (yes, seven!) with you. Most of them are from Damn Delicious and How Sweets It Is, my two favorite food blogs! Once you start freezing food, you really can’t stop. I’ve been doubling most of my recipes so I can freeze a lot for later. Then when we need a quick meal or snack on the go (perfect when you have kids, obviously) we’ve got something all ready! Have any recipes I need to try? Let me know! 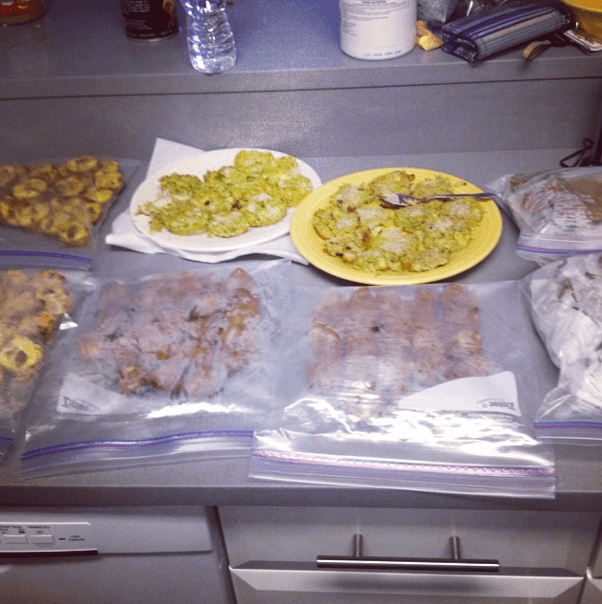 Ashley and I made freezer meals back in the Winter and loved it so much. 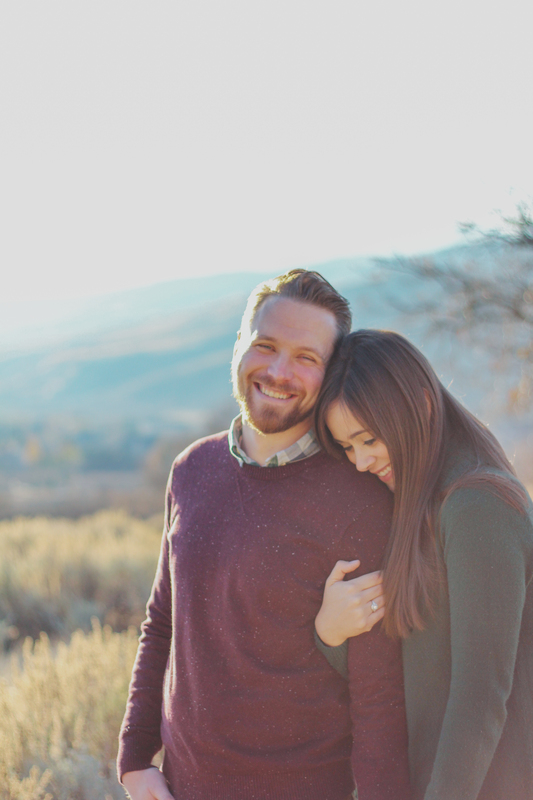 It took a lot of time, but I thought it was completely worth it because it helped us save money and was perfect for Winter days when I didn’t want to cook dinner, but could still have a hot meal in the crockpot ready in no time. In the summer though, I’m pretty good at cooking dinners since there are so many delicious fresh vegetables and fruits available. But breakfast and lunch sometimes are hard for me to think of ideas. If it was just me, I’d grab a breakfast drink in the morning and have a lean cuisine for lunch… but I can’t do that to my child. 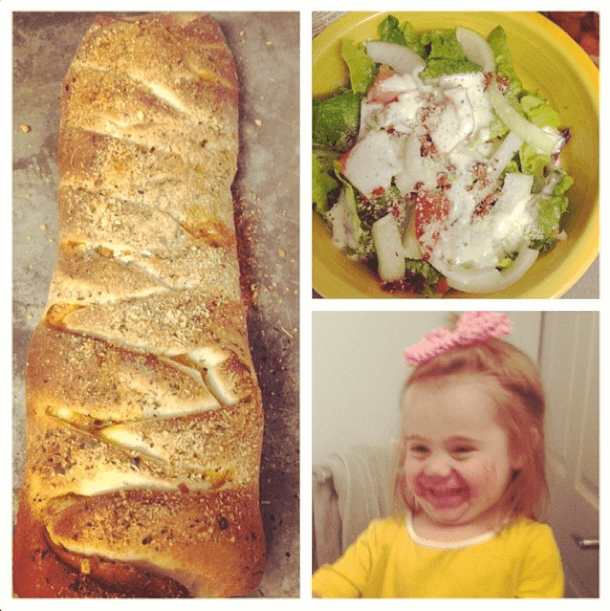 And I get sick of making PB&J everyday… plus, my kid won’t even eat all the time. 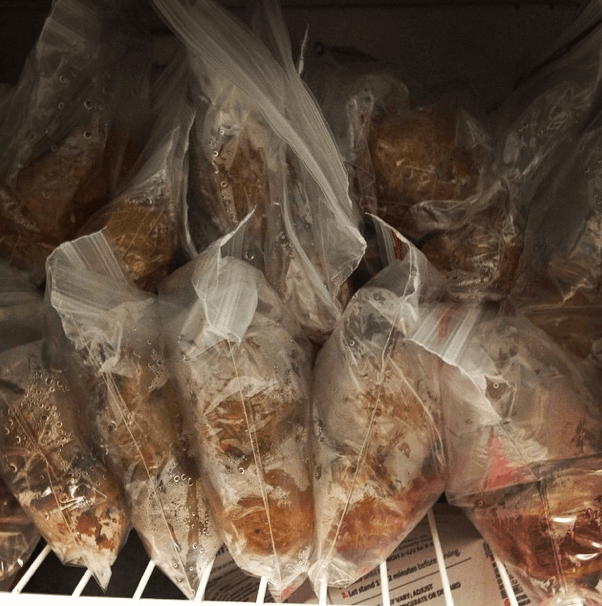 So, enter the toddler freezer meal craze that happened this week. It all started when Ashley made some zucchini muffins. They were a hit with her son and she was able to freeze a bunch for the future. So, I decided to make a batch, too, because I tend to copy everything Ashley does. When I pulled out the zucchini to make the muffins, I realized I had some carrots I needed to use up. Then I thought, well I might as well make some carrot muffins while I’m at it. (Does this remind you of the “If You Give a Moose a Muffin” book?) Once those were in the oven, I thought… Since there’s already a mess, let’s make some pancake muffins! And as those were cooking, I decided I needed some muffins with chocolate in them… so I made oatmeal chocolate chip muffins too. By the end of the night, I had made 96 mini muffins and 36 regular muffins (I doubled some of the recipes). I divided the mini muffins up in baggies of 6, and regular in baggies of 2, then stuck them in the freezer-even color coded the top of baggies for easy grabbing in the future. They’ve already been a huge hit in the house! Perfect to take in the lunchbox to the pool or for a snack/part of a meal. It took about four hours, and made us wash the muffin pans about a hundred times, but between both of us, we made 36 spinach whole wheat pancakes, 50+ mini BBQ chicken apple cups, 24 zucchini quiches, 60 mini sweet potato chicken egg muffins, and 60 mini egg and pepper frittatas! I don’t know if you can comprehend how much food that is, but let me tell you… it’s a LOT! AND IT WAS AWESOME! My child has eaten SPINACH PANCAKES for breakfast now two days in a row, and she doesn’t even know. She thinks they’re just special green colored pancakes. They even taste like regular pancakes, much better than those banana and egg pancakes. Use LOTS of spray on your cupcake pans because it gets very old scraping them out and washing them over and over again. You could probably make the BBQ muffins on a cookie sheet, like meat balls. For the zucchini cups, do it as mini muffins because they’re very heavy and kind of fall a part if you don’t cook them long enough in the large muffin pan. 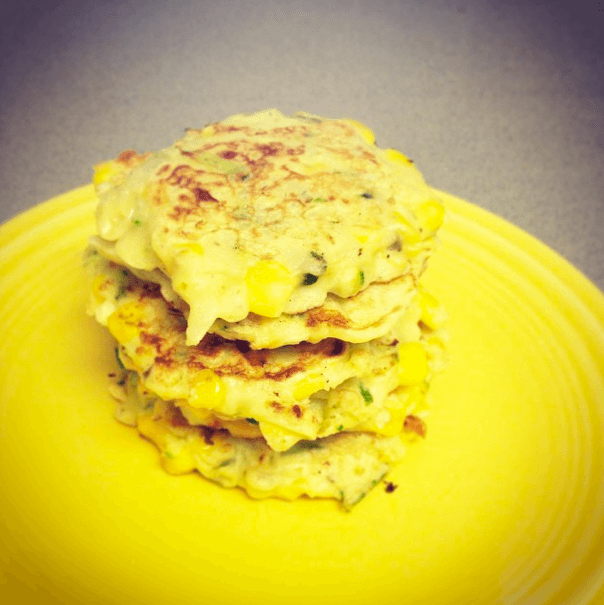 The chicken apple/sweet potato muffins don’t need NEARLY as many eggs as the recipe says… we had TONS left over, which is why we ended up making the frittatas. It was very strange. The sweet potato ones are my favorite from the second list… they’d be perfect for a brunch if you’re throwing a baby shower or something. So delicious. Okay… ready, set, go! Go make your freezer meals and feel like a champion of a mom for a day! One night last week, Eva said she wanted pizza for dinner. So, I made a little braided pizza loaf from the Six Sisters’ Stuff with a side salad. It looked fancy, but the loaf was just from a pilsbury dough container. 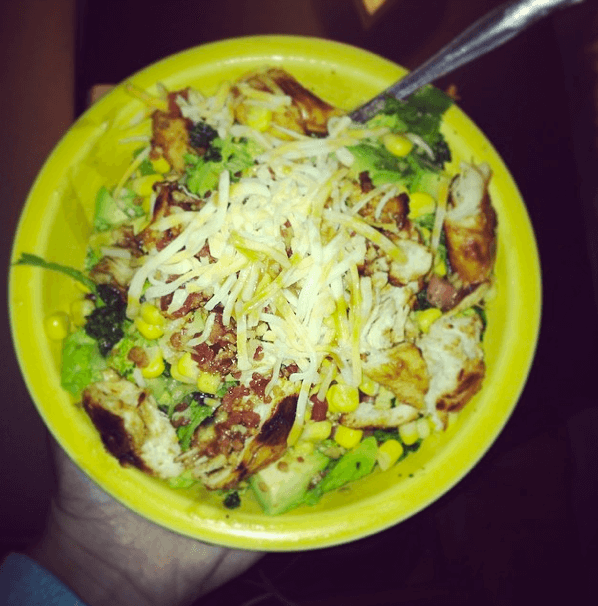 I made a copycat olive garden dressing for the salad. I’ll tell you what. Once you start making your own dressings, you can never go back to store bought. It was so delicious! Oh and as a bonus photo, you get to see how proud Eva was when she got into my lipstick. I did scold her quite a bit, but then we had a pretty good laugh at how crazy she looked. One of my favorite food blogs is howsweeteats.com. She’s always posting delicious recipes and her photos make everything look so appetizing. Her BBQ Chicken Chopped Salad with Grilled Garlic Croutons was no different. I tried the recipe on Tuesday, ate the leftovers for lunch yesterday, and will probably make it again today for lunch with the extra BBQ chicken. That’s salad three days in a row. Probably a record for me. The homemade dressing is delicious. 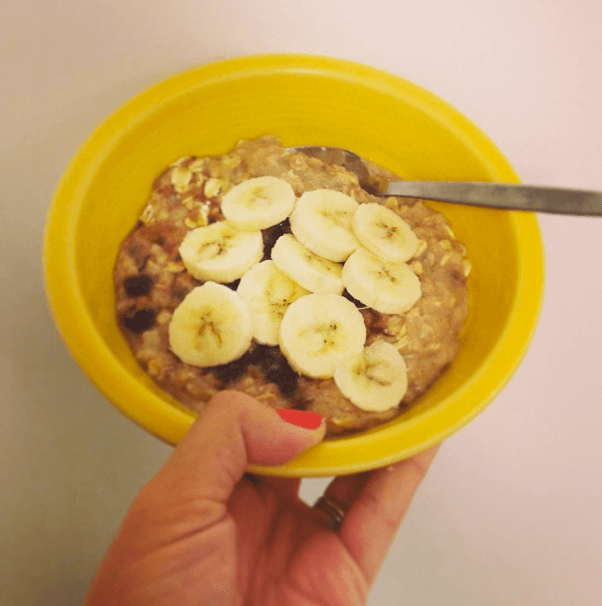 So, put this recipe on your meal plan next week! PS-I made a lot of substitutes and cheats… I used a george foreman, cut out the croutons to cut calories, used bacon bits and canned corn. It was still delicious. Here’s the thing. I love Mexican food but T.J. is not a huge fan. He doesn’t mind it once in a while, but I could eat Mexican food everyday. And when I say Mexican food, maybe it’s not authentic, maybe it’s Tex-mex, but usually it includes something like rice, beans, guac, salsa, corn, cilantro, etc. Well, for Cinco de Mayo, it was the perfect excuse to try out a new recipe or two for dinner. 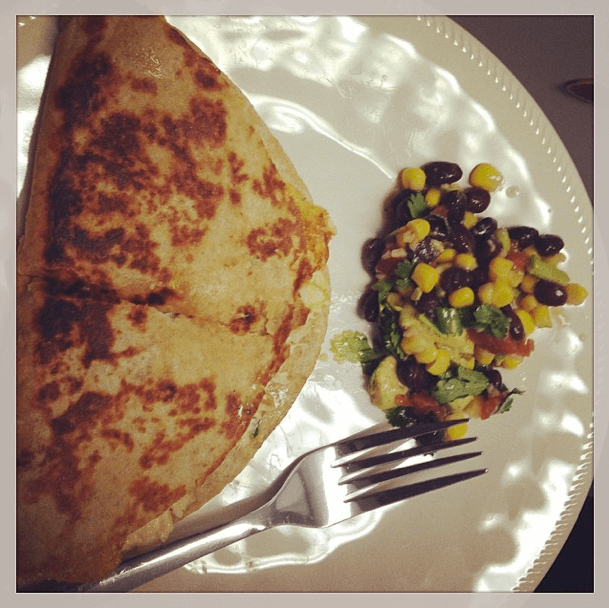 I made chicken quesadillas and homemade salsa. The chicken quesadillas (aka Crispy Chicken Wraps) were SO easy to make. Cook your chicken, shred it, add some mayo, sour cream, cheese hot sauce, cilantro, and green onions… throw it inside your quesadillas and heat it up in a little olive oil on the stove. Delish. And for the homemade salsa (aka Cowboy Caviar), even though T.J. says this doesn’t count as salsa because it wasn’t a tomato base (I put half the amount of tomatoes in that the recipe calls for), we ate it SO fast. I’m obsessed with this recipe and could eat it errydayallday! I usually have all the ingredients for this on hand anyway, so I’ll definitely be making it often! 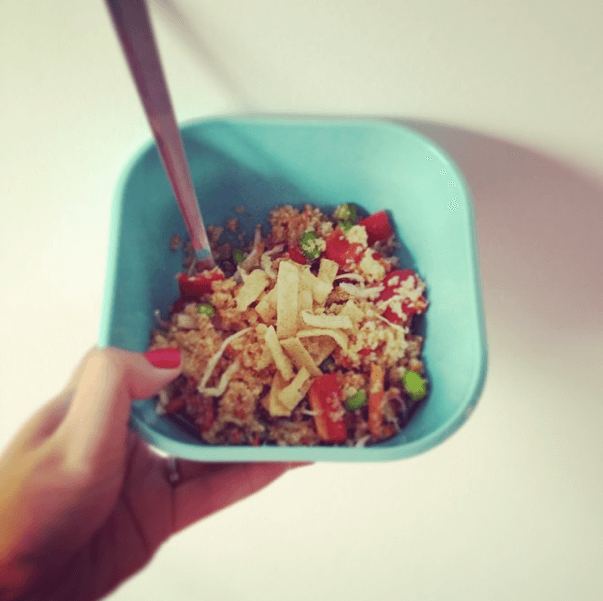 So, if you want to make a fast and easy meal for tonight… try this! Last month we went to an Indian restaurant nearby. My Indian friend from church said it was her favorite, so I knew we had to try it. Apparently, at lunch they have an all-you-can-eat buffet! I gotta try that! We went for dinner and it was soooo good, but definitely on the pricey side. 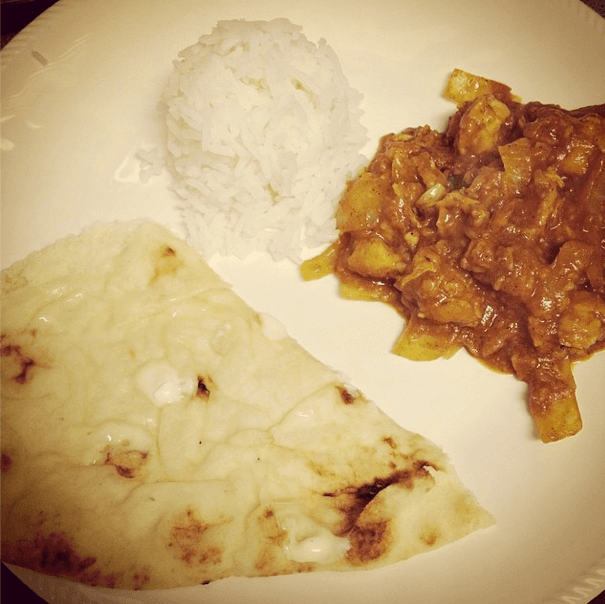 It made us want to eat MORE and MORE Indian food, so I tried out a new curry recipe. All the ones in the past I’ve made have been in the crockpot, but this one is ready within a half hour or so and is so easy. I had all the ingredients on hand already, so double win! Add onion and garlic to pan, adding a little more oil if necessary, and cook for 2 minutes, then add broth and tomato paste. Serve with jasmine rice (Target has a quick cooking kind) and naan bread. I have a really neat cook book gifted to me by my bro. and sister-in-laws with budget friendly meals. I think it’s one of my favorite cook books because there is a huge picture of each recipe. It makes the process of finding a recipe that looks good so much easier! Last night I looked in the “Fast” section because it was getting late and I hadn’t prepared dinner yet. I found this recipe for an Asian Noodle Bowl and went for it. Within 15 minutes I had a delicious dinner full of vegetables! Mix barbecue sauce, hoisin sauce, peanut butter and ground red pepper; set aside. Heat oil in 12-inch skillet over medium heat 1 to 2 minutes. Cook onion and bell pepper in oil 2 minutes, stirring frequently. Stir in broccoli and water. Cover and cook 4 to 6 minutes, stirring occasionally, until broccoli is crisp-tender. While vegetables are cooking, fill 4-quart Dutch oven about half full with water. Add 1/2 teaspoon salt if desired. Cover and heat to a rapid boil over high heat. Add noodles; heat to boiling. Boil uncovered 4 to 5 minutes, stirring frequently, until noodles are tender. Stir corn and sauce mixture into vegetable mixture. Cook uncovered 3 to 4 minutes, stirring occasionally, until mixture is hot and bubbly. 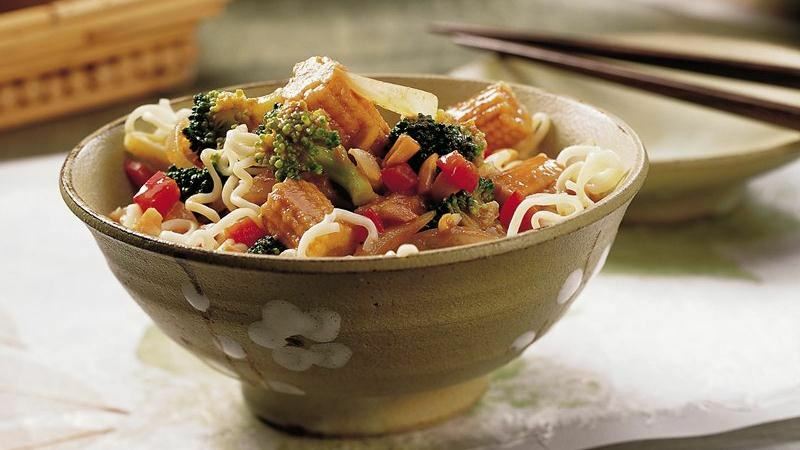 Drain noodles; place in individual bowls and top with vegetable mixture. Sprinkle with peanuts.